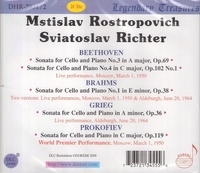 "This one-of-a-kind release features two of the leading musicians of the twentieth century, Mstislav Rostropovich and Sviatoslav Richter in live performances of sonatas. Especially notable is the Prokofiev sonata from Moscow 1950, which was the piece's world premiere performance. Two other sonatas, by Beethoven and Brahms, are being released here for the first time. These two concerts took place in March 1950 and June 1964, when both of these remarkable twentieth century musicians were at the peak of their careers." “Mstislav Rostropovich, the cellist and conductor was renowned not only as one of the great instrumentalists of the 20th century but also as an outspoken champion of artistic freedom in the Soviet Union during the last decades of the cold war. As a cellist, Mr. Rostropovich played a vast repertory that included works written for him by some of the 20th century’s greatest composers. Among them were Shostakovich’s Cello Concertos; Prokofiev’s Cello Concerto, Cello Sonata and Symphony-Concerto; and Britten’s Sonata, Cello Symphony and three Suites. Perhaps because his repertory was so broad, Mr. Rostropovich was able to make his cello sing in an extraordinary range of musical accents. In the big Romantic showpieces — the Dvorák, Schumann, Saint-Säens and Elgar concertos, for example — he dazzled listeners with both his richly personalized interpretations and a majestic warmth of tone. He could be a firebrand in contemporary works, and he seemed to enjoy producing the unusual timbres that modernist composers often demanded. He played the premieres of solo works by William Walton, Georges Auric, Dmitri Kabalevsky and Nikolai Miaskovsky, as well as concertos by Alfred Schnittke, Arvo Pärt, Krzysztof Penderecki and Lukas Foss, among others.